The loss could spell trouble for future sea-level rise. Anyone blindly walking across the Antarctic Peninsula might be in for a heck of a fall. A stupendous rift reaching across the land measures 300-feet wide and one-third of a mile deep, a drop equivalent to the height of seven stacked cruise ships. The icy canyon, which has been lengthening in the past months, is a sign the Larsen C Ice Shelf is about to shed a ton of mass. Specifically, it’s going to pop off an iceberg roughly the size of Delaware. That may or may not be a bad thing for the world: While the Antarctic is constantly losing and regrowing ice, the pace at which it happens can be a contributing factor toward future sea-level rise. Cracks and calving of ice from the front of an ice shelf are normal. Shelves are fed by glaciers and ice streams coming from the interior of the continent. They advance into the ocean until a calving event takes place. The shelf front retreats and then advances again. The whole cycle can occur over the span of a few decades. But calving that happens faster than a shelf can re-advance can mean trouble for an ice shelf. For example, large and frequent calving events at Larsen B preceded that shelf’s final period of rapid disintegration, which occurred in just six weeks in 2002…. 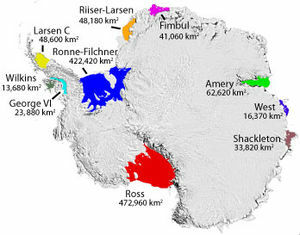 Ice shelves float, so they do not directly contribute to sea level rise. They are important, however, because they buttress land ice and keep it inland. If a shelf disintegrates, glaciers that feed it can flow more quickly out to sea—a process that directly increases sea level.